Martin’s Ideas: A More In-Depth Look at Dr. Martin Luther King Jr.
By Dr. David Childs, Ph.D.
With the celebration of the Rev. Dr. Martin Luther King’s life and work it is a good time to take a deeper look at his legacy. The celebrations of Martin Luther King usually consist of an emphasis on his most popular speeches, his marches and also his death. Although, popular tributes to King are of the utmost importance, they fail to take an in-depth analysis of his more complex and sophisticated ideas. When one delves deep into the works of Dr. Martin Luther King, one discovers that he talked a lot about many democratic principles such as justice, freedom, equality, fairness and creating what he called the “beloved community.” These principles can apply to societal challenges today. This article offers resources that can help students, the general public, teachers and scholars take a more in-depth look at Dr. Martin Luther King, Jr. It provides some information and resources outside of mainstream portrayals of Dr. King that may be useful tools in addressing some of the social and political challenges in which we find ourselves today. Dr. King was vilified, harassed and eventually murdered because his ideas challenged the status quo and the established order. Ironically, many people that celebrate Dr. King in our time would not have supported him when he was living and would have considered him to be a radical. Martin was a man of great integrity, who was very kind and selfless as well. However, his unpopularity came because he courageously spoke out and pushed against the establishment. Stephen and Paul Kendrick in an April 3, 2018 Washington Post Op Ed article wrote “In our long effort to moderate King, to make him safe, we have forgotten how unpopular he had become by 1968. In his last years, King was harassed, dismissed and often saddened. These years after Selma are often dealt with in a narrative rush toward martyrdom, highlighting his weariness. But what is missed is his resilience under despair. It was when his plans faltered under duress that something essential emerged. The final period of King’s life may be exactly what we need to recall, bringing lessons from that time of turmoil to our time of disillusion.” Right up unto the day that he died, King had many critics, but after he was killed people celebrated and praised him. Perhaps this is because many people are not always willing to make sacrifices, but when the time comes for accolades there are no shortage of supporters. How might Dr. King’s ideas about equality and moral law be applied to some of the sociopolitical challenges we see in our time? Dr. King’s letter from the Birmingham Jail is a good source too add to the discussion about the many critics he had. Martin chose to go into the ministry after first considering being a medical doctor or lawyer. In his writings, he states that the church and his role as a minister gave him the best resources and platform to answer “an inner urge to serve humanity.” Thus, the opinions of his fellow ministers (He directs the letter to his “fellow clergymen”) was very important to him. Apparently in King’s day many of the ministers were very critical of the work he had been doing. He starts off stating “while confined here in the Birmingham city jail, I came across your recent statement calling my present activities unwise and untimely.” He goes on to say that “If I sought to answer all the criticisms that cross my desk, my secretaries would have little time for anything other than such correspondence in the course of the day, and I would have no time for constructive work. But since I feel that you are men of genuine good will and that your criticisms are sincerely set forth, I want to try to answer your statement in what I hope will be patient and reasonable terms.” As evident in this quote, one can clearly note that Dr. Martin Luther King Jr. was not always viewed as the kindly, soft, superhero in which society views him today. As the letter also indicates, some of the disapproval came from his colleagues in the ministry. To be fair, Martin enjoyed immense popularity among many people, but he had just as many enemies as he had admirers, if not more. One of the principles King is most noted for is his practice of nonviolent resistance. However, it is not common knowledge that he did not start out this way early in his work. But, through much of the literature he read and those who mentored him he moved in that direction. His advisers showed him an alternative to violence and how nonviolent resistance can act as a powerful tool. The goal was not to humiliate one’s opponent but to win them over as a friend. He took to the idea also because of his religious beliefs as a Christian and a Baptist minister. Two of King’s primary advisers were Christian theologian Howard Thurman and white activists Harris Wofford, from the Christian pacifist tradition. Another one of King’s key mentors was veteran African-American civil rights activist Bayard Rustin, who helped coach and train him in strategies of non-violent resistance. Both Wofford and Rustin both studied Gandhi’s teachings and exposed King to his philosophies. In King’s early activism in the 1950’s he rarely used the term “nonviolence” and knew very little about Gandhi’s work. Surprisingly, King did not always subscribe to nonviolence and early on believed in self-defense. King had even purchased firearms to protect his family from attackers in his home. Later in his activism he strongly and publicly denounced the personal use of guns, however Dr. King always had conflicted views of self-defense. Even though he spoke out against self-defense, many of his associates carried fire arms to protect him. So perhaps he was influenced by the realities of his day and black activist who unapologetically advocated for the use of violence if necessary. In the media and at MLK events when one hears excerpts from King’s most popular speech entitled “I have a Dream”, it is heard starting from the climax toward the end of the speech that repeats “I have a dream.” We hear King begin this segment with the lines “I say to you today, my friends, so even though we face the difficulties of today and tomorrow, I still have a dream. It is a dream deeply rooted in the American dream. I have a dream that one day this nation will rise up and live out the true meaning of its creed: “We hold these truths to be self-evident: that all men are created equal.” Even though these words are electrifying and speak of high moral ideals, people miss equally deep and powerful concepts discussed earlier in the speech. For example, in an earlier part of the speech Dr. King states: “Now is the time to make real the promises of democracy. Now is the time to rise from the dark and desolate valley of segregation to the sunlit path of racial justice. Now is the time to lift our nation from the quicksands of racial injustice to the solid rock of brotherhood. Now is the time to make justice a reality for all of God’s children.” Even though these words were spoken in 1963 it applies to our time period as if it were written for today. There has long been the popular notion that America has moved well past the injustices and racial prejudices of the Civil Rights era, however with the rise of hate groups, white supremacy and racial rhetoric in our society, it seems that the nation has regressed and given way again to racial divisions on a wide scale. Indeed, the line “Now is the time to lift our nation from the quicksands of racial injustice to the solid rock of brotherhood” can be applied to today as our country becomes more and more divided along racial lines, Martin’s “I Have a Dream Speech” speech reminds us that racial injustice can act as quicksand that can impede progress in our land; it can cause us to be stuck. But King’s legacy reminds us to lift up our nation toward a more just society. • What progress has been made in terms of racial reconciliation sense Dr. Martin Luther King Jr.’s time? • How much progress have we really made in terms of race relations and equality since the Civil Rights era? • Are there incidents, events or attitudes in today’s society that remind us of the times in which Dr. King lived? If so, what are they? • Dr. Martin Luther King Jr. talked a good deal about race, but he also talked about economic injustice, do you think we have made much progress in terms of economic equality? • If Martin were living today how would he feel about society? What kinds of things might he be saying? Below are a number of lesson plans and resources for teachers and students that offer a more in-depth study of the life and work of Dr. Martin Luther King, Jr.
“But If Not” – A Sermon by Martin Luther King, Jr.
“Why Jesus Called A Man A Fool” (Sermon) Martin Luther King Jr.
Martin Luther King Jr. was stabbed by a deranged woman. At 29, he almost died. I think that if Martin Luther King Jr. was alive today, he would be very upset with this country. There was a time where segregation was decreasing and less people were becoming racists, however, that’s not the case anymore. Now it’s as if times are slowly going back to what they used to be. I think if Martin was alive he would be saying how he had traded his whole life to try to demolish racism and it is as if no one cares. I think he would be saying that for a country that is known for freedom, we sure don’t act like it or treat this country and it’s people like they deserve. I think overall Martin Luther King Jr. would be disappointed in the way this country is. This article made me more aware of just how much Martin Luther King Jr. was a normal person. I think we often immortalize him and talk about all the change he encouraged. We forget he is human quality like how to handle violence, and that not every war was won with ease. I had no idea that King wasn’t a big fan of nonviolence protest at first. While reading this article about how we can still apply the “I have a dream” speech to our culture, was a complete shame to me. I would say the life that King wanted for his children is better than it was at the time, but its anything from perfect. I personally don’t understand the great divide, but why is it after 55 years we still do not respect one another, and racism seems to be raising. When will enough be enough? I think your point about how Dr. King was not always viewed as the saint he is today is very important. I think if Dr. King was alive and an activist today he would be deemed with a negative view. Fox News would probably call him a crybaby, and the president would probably have tweeted at him a few times. Slavery and segregation were not thousands of years ago. Many can still tell stories of their separate bathrooms. I believe Dr. King would try and call out institutionalized racism today. To be completely honest, I learned more about Martin Luther King Jr. from this article than I learned in my 12 year of elementary, middle, and high school. MLK, in my experience, is only discussed around Martin Luther King day. Typically, people are more excited about getting the day off than learning about the man who gave us this day. This year on MLK day, I went to the Freedom Center in Cincinnati to learn more about the past and about things I was unaware of. I learned a lot of things from this article that I was unaware of too. I could repeat the common “I have a dream…” passage to anyone who asked, but I had no idea how rich the rest of his speech was. I completely agree with Dr. Childs on the fact that his whole speech is relevant today as much as it was then. As a future teacher, I hope to incorporate more of Martin Luther King Jr and his teachings into my classroom, not just around his day, but throughout the school year. In our society we place a great emphasis and importance on Dr Martin Luther King Jr as we rightfully should do, however it is irresponsible of us to place him on such a high pestel that we cannot recognize who he really was, and what he truly believed. By sainting this man, we fail to recognize that he was hated and persecuted, yet he still persisted, we fail to recognize his imperfection and struggles. Ultimately we make him into such a perfect person, that we discourage new activist to pursue social change, because they feel they are not able to because they aren’t perfect like the men and women who came before them such as Dr Martin Luther King Jr. I think that shortly after his death things did begin to change and I believe that slowly things became more fair and equal for everyone. But like you said I think we are regressing. Instead of getting farther away than that we are just backsliding. The parts of Martin’s speech that were left out are just as important as the parts that are more notorious. If he were still alive I think he would not see that we have improved instead he would still be trying to help us all be equal and treated fairly. I think we often immortalize Martin Luther King Jr. and talk about all the change he encouraged and even made, but we often forget how much of a normal person he actually was. As Americans we often forget that is just like us and all he wanted to do is make the world a better place for future generations, just like most of us want to do today. While reading this article I kept thinking about how we can still apply the “I have a dream” speech to our culture and how it is important that we keep growing as a country. It is crazy to me that after 55 years we still have so much room to grow as a country even though we have come so far since Dr. King’s time. We are still a very divided country and have so much more growing to do and still can learn from Dr. King and his speech. I like how you mentioned at the end that the words that Dr. King spoke are still relevant for today. I believe a major factor in the regression of racial equality is social media. So many false or biased articles are written, along with their headlines blasted everywhere that have an agenda to make people of color look bad. I hope that in the future the many resources we have through social media can be used to give people facts and information, not lies. I believe that if Martin Luther King Jr were living today he would agree that we have taken steps backward when it comes to racial divide and discrimination. I imagine King would be giving encouraging words to motivate society just as he did during his time spent on earth. He would be reminding us of how far we had come to turn back around and repeat history the way it was before. However, I think he would be heart broken to see the brokenness that still remains and even is digressing now more than ever before within the world. If , I were him, I would be expectant of someone to stand up today just as his did and fight for what for those barriers to be broken. Lastly, I was surprised to be informed about Martin being a rather unpopular guy before his speech and the way he influenced society compared to how well known he is today for his speech and the movement that was made because of his impact on the world around him.I think it is awesome that even though there were people in his time that didn’t agree or support King, that he stood grounded in his beliefs and took action regardless of what lash back might be in response to him. I thought that this article was very insightful and really showed me more than what society today shows of his life. Like a few people have said before me and like you said unfortunately our society is going backwards people have so much hate towards one another and I am very saddened by this. Also,when reading this I thought to myself how important it is to teach my students the reality of what life was like for MLK Jr. and once they reach a certain age to listen to the whole speech. I think this because it could be a great lesson to teach students to stand up for themselves and what they think is right even when others are against them. Up until last week I had never heard or read his full I have a dream speech and the whole thing is so powerful that I wish I had heard/read it sooner. This article was very informative and showed the growth that Rev. Dr. Martin Luther King Jr. made throughout history. I have absolutely no doubts that if Martin Luther King was alive today he would be hated. Though society has grown and we live in a society where equality is more accepted. Because of the loss of innocent lives of African Americans with law enforcement, it makes it seem like we’re going back in time. To comment on why Dr. King was not always popular, I think it is because he spoke bravely and confidently in what he believed in and that made a lot of people uncomfortable. I feel like things are the same way today but with slightly different topics. King knew he could not please everyone, but that was not what he was trying to do, he was trying to raise awareness bodly which made people dislike him. I have always had a high respect for Dr. King. My parents would read me books on civil rights when I was younger and taught me about how Dr.King who fought for what was right. We would watch Dr. King’s “I had a dream speech” on Martin Luther King Jr.’s day. The biggest lesson my parents wanted me to learn from Dr. King, and all those who fought for civil rights, was God created us all equal. Reading over Dr. King’s nonviolence in the article I understand why he was conflicted. As a parent and husband he wants to protect his family. I hope to fight for what is right and just just like Dr. King. Dr. King has always been one of my favorite people in history. I am firm believer in equality and everything he believed in. Until reading this article I never really thought about King as just a “normal” person. When I think of the history of King I only remember learning his famous moments. I believe I have learned more about Dr. King after reading this article and the links provided than I have through my entire education. Although society has changed since Dr. King’s time, I think there are still instances that are similar to how things were back then. For example the election of president Obama caused an uproar for some because of his race even though he was qualified and willing to fight for our country. I believe the rights of equality have improved but society views still want to hold those racial boundaries. If Martin Luther King were alive today I think he would be content with the way things are because of law changes but I feel that he would continue to push to persuade society to become open to equality for all races. My favorite thing that I have read written by Dr. Martin Luther King Jr. was the article he wrote in Jail in Alabama. He stood up for himself and the people being discriminated against even locked up. It is a fun article to read about how he calls out everyone who did not think he could do anything about it because he was in jail and boy did he prove them wrong. When thinking back on Martin Luther King and his legacy, I often forge that he too was mortal and dealt with his own conflicts outside of societal issues. I never knew he had conflicting ideas on gun use and that early on in his activism he was not all about his “nonviolent” ways. I love that it is mentioned that he had mentored that helped him realize his activism could be done peacefully and humanly because often times in today’s society, many people turn to him as a figure to follow. It is my opinion that it is safe to say that as a nation we are more divided now than we have been in some time. I think it is an accurate observation and I agree with the article comment that we as a society could use the perspective of Dr. King since we are now dealing with hate groups, racial divide and socioeconomic tensions. What we have now does not feel like the democracy that Dr. King wished for and we are no closer to having a “beloved community” than we were back then. Deep rooted values for justice, freedom, equality and fairness are often overshadowed by other issues. In my personal opinion, I feel that we haven’t made much progress of racial reconciliation since the time of Dr. Martin Luther King Jr. There are still many issues with racial slurs, stereotyping and equality. I find it ironic that during the life of Martin Luther King, he wasn’t very well liked and his views were not agreed with UNTIL he had passed. Now Dr. King is honored and his views are well understood and are trying to be made a part of today’s society. While I do agree with these behaviors, I still feel that there are many people that are unwilling to change their mindset. Slavery and segregation are still a part of today’s society in different parts of the United States. I think considerable leaps and bounds have been made since MLK’S time. As a society people are diversifying and welcoming each other and ideologies that would have been considered nonsense only 60 to 70 years ago. I think often times we view the world as being in turmoil in situations in regard to the way races are perceived due to what we see in the media. The media likes to focus on things they know is going to get attention. The next time you watch pay attention to the ratio of bad to good. I think economic equality in current time is ultimately the factor of an individuals choices not their race. There for I do not think that race has ever been a dominant factor in deciding rather economic status is constructed. Often times people get to where they are by their actions and decisions and not learning from them. I think if Martin Luther King where alive today he would take note of the progress that has accumulated over the time. As early as February 20, 2019, Senator and Presidential candidate, Elizabeth Warren “blamed generations of discrimination for black families earning far less than white households” (NY Times). This article goes on to talk about Democratic policy makers who are openly talking about reparations and policy changes that brings true equality through opportunities. It is clear that the country is yet, still, grappling with the same issues that Dr. King addressed decades ago. On reflection, it seems Dr. King began the work and through time has gotten us moving forward on racial equality, and there is more work to be done. Hopefully, soon, another leader and champion will become apparent. Sooner rather than later, especially with the current U.S. administration trying to turn equality inside out. Dr. Childs’ article helps us to reflect on the real challenges Dr. King faced, perhaps bringing down the idealized persona we celebrate today. Surely Dr. King grappled with his own day to day emotions, and remaining clear on his convictions and beliefs in terms of commitment and sacrifice. This article is good. I have heard and talked about King but never looked deeply into his life. I have seen and read a lot of really good articles about him. On the other hand I have heard that he was not an all around great man. I’ve heard he was adulterous and was not always the “I have a dream” man. What are your thoughts on the other side of things that King was part of that a lot of people look past because of his greatness? very well written article. This man’s life was incredible but different, he was mostly a good man and did a lot of great things dispite the few negative things he has participated in. If Dr. Martin Luther King lived in our society today I think he was be very disappointed. Dr. King put in so much effort and even his life into fixing the society there once was and ending segregation. He did the work of getting everyone to love each other no matter what color you are. I feel like in a way, we are slowly starting to go back to that. No, there’s not segregation laws saying blacks cannot go into schools, stores, churches, etc., but there are many people in this world today that show racism and we can’t all be kind to one another. If Dr. King was here today I think he would give another speech saying everyone needs to get their act together. Sure, we might all have different color skin, but that does’t change us from being human, from having a heart, or not being able to be kind to one another. We are all capable of being kind, so lets do it and lets all get along. I think that it is so important for people to know that Dr. King wasn’t always viewed as a heroic person like he is today. But in reality there are people that still despise Dr. King and unfortunately they are part of the caucasian race. I feel that if Dr. King was still alive today that people would still view him negatively. Although he tried to incorporate a good thing for the African race, as well as, create equality, people viewed him as powerful and demanding which is why I feel that people viewed him so negatively. I think as a teacher it is very important for me to incorporate and view Dr. King as a heroic man who pushed equality among black and whites, and teach children the importance of equality and Dr. King’s efforts. I think its really interesting how you touched in how Dr King wasn’t always thought of like he is today. Also I really liked how you went so in depth, a lot more than my past teachers have, It seems like always focused just on the one day a year. I feel like Dr. King would still be upset with how we are today, maybe not for the exact reasons, while some still apply but just how we have grown as a society. I thought this article was extremely interesting. This article made me reflect on all the years I was in school and how many times I was “taught” about the work of Martin Luther King Jr and how it barely scratched the surface. There was so much in this article that I never knew about Dr. King. The only think I distinctly remember learning was the last minute of his “I have a Dream” speech. While it is very important, there is so much more that could have been taught that would have given me a better insight on the legacy of Dr. King. One quote that really stuck out to me from Dr. King’s letter from the Birmingham Jail was, “Injustice anywhere is a threat to justice everywhere.” I think that this is still relevant in todays world and hope that there is a shift toward teaching more than just the surface level work of Dr. King because there is so much that we as a society can learn from him. This article was very thought provoking because it covered information that is not always discussed when you learn about Martin Luther King Jr., and it often overlooked. Looking back in school, I remember learning about how impactful MLK Jr. was and how his “I Have A Dream” speech was revolutionary, but nothing close to this. As I grow older, I continue to find myself finding out new information about his legacy and life, and I want to instill these concepts into my own classroom. Also, I appreciate the amount of resources you gave us at the end of the article, including various lesson plans that are divided by grade level and discussion questions to instill higher order questions that can start a great discussion within a middle school classroom. It will be an extremely helpful when it comes time to teaching my students about the life and impact of MLK Jr. It gives me confidence I am able to give my students an opportunity to dig deeper into who he is and what his life entailed beyond the common concepts that are spoken about that I was not afforded during my own middle school classroom. 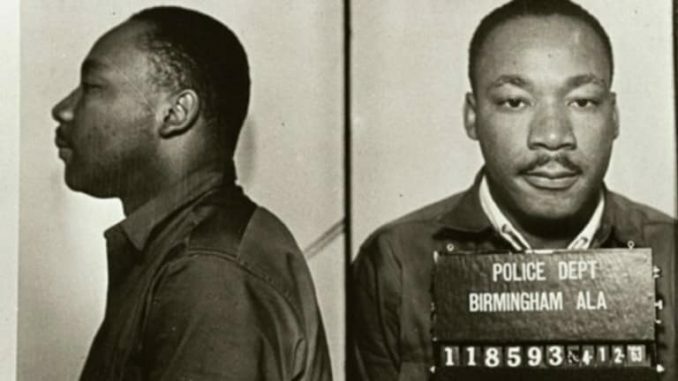 The most impactful part of this article would have the be the section on “Letter from a Birmingham Jail” because up until recently, I never knew this occurred, nor that he had a mugshot that told a major part of his civil rights journey. I really enjoy that, and although back then he was often criticized for what he was doing, it only made what he did more powerful and awe provoking. wow, this was a good article. There was so much to learn about MLK in this article. admittedly I have very little knowledge of MLK. I only knew what they taught us in school. This was not much though. this is just like what your article talks about. I until today had no idea that MLK was not always a non-violence believer. I also did not know that his speech has never really been fully grasped by readers. and that is not a just society for blacks but a just society for all mankind. This struck me because it is true we all need to stick together and help our brothers and sisters undergod to create a better future. If we all worked together and ended the hate we could accomplish so much more as a human race. I hope we all can learn this message one day. The story of Marten Luther King Jr. is such an important topic in school. Yet this is also the topic that is just skimmed over for his accolades and his accomplishments. There is little taught about the struggle that MLK felt in his day. This is a man that was a minister, and all he wanted to do was help all people. His pursuit to create a just society was not an easy road but he persevered, and progress has been made. Schools today could benefit from this lesson for two reasons. The first is the most obvious, and most taught today the social injustice and that it is not okay. The second lesson that is missed when you don’t take a deeper look at MLK’s life is his struggle and his perseverance over these struggles to promote change. This is a powerful lesson for students to learn so they see that struggles are needed in life to make room for the change in our lives. I am grateful that this article gave me a deeper understanding of MLK’s life and lessons we can learn from. I will be using his struggle as an example to my students not to back down from change, but to overcome it. It was shocking to me to read about how Dr. King didn’t always use nonviolence. The way we see him today and the pedestal we have him on makes him seem perfect. It’s interesting to learn about the “not-so-perfect” parts of him as well. As I read this article, I thought of March Book One. Although the book was not mostly about MLK, it did tie into his teachings and thinkings. I enjoyed learning more about a figure in history that is so widely known, but I do not know much about other than the “I Have a Dream” speech. I learned a lot about Dr. Martin Luther King Jr. from this article. In school, we only focused on his I have a dream speech and his marches. I think it is very important for teachers to discuss Dr. King in more detail than just his one speech. It is important for students to know that he was a real person and understand that his ideas were radical at the time and many people disagreed with him. It is also important for students to understand that there are many themes within his famous I have a dream speech and it is much more than just the famous couple of lines that are always discussed. I believe that it would also be very beneficial to students to read his letter from Birmingham jail because there are many ideas from this letter that are still relevant today.